I am starting a new thread, splitting up the TRIPLE THREAT thread. This one is a build thread for my wife's 2005 Z-71 xtra cab shortbox. I am moving along on it at a nice pace and i really dont want to mix it all up with the other two trucks. You might be wondering why the title of this thread is WHO DCTR ? Well my wife and i are both Doctor Who fans, I have been for a long time and when we met she had no idea who Doctor Who was so i made her binge watch all of the NEW Doctors. She is hooked. When we bought her 2010 Kia Soul a few years ago she wanted a blue one because she wanted to deck it out in DW stuff, the kia is brown(ish). So along comes this truck and, well, its BLUE, as you will soon see. I bought this truck from a towing impound yard for cheap. SWMBO has no idea that i bought it or that it even exists in my shop. After doing some thinking and then realizing that it was indeed blue, i figured this would be a good opportunity to decorate it up with some Doctor Who stuff. I have a list of DW things that i want to do to it, but the first thing that i could do was order a personalized license plate. EVERY thing that i could think of that would fit in 7 or less characters pertaining to the DW show was already taken. The only thing that i could come up with that was still available was WHO DCTR. This is hopefully going to be a short build with a lot of work, I am planning to present this to my wife as a christmas gift. 5 WEEKS FROM NOW!!! Now a little info on the condition of the truck when i bought it. just to give it some perspective as to where i am now and where i am going with the work that i am doing and what still needs to be done. The truck was ugly when i bought it. hit squarely in the front between the frame rails, sorry no photos of this. the front sheet metal was fubar and needed to be replaced. the left side doors as you can see where also fubar. and if you look closely you can see there is a dent in the cab behind the left half door in the top corner. The bed is rough but totally fixable. 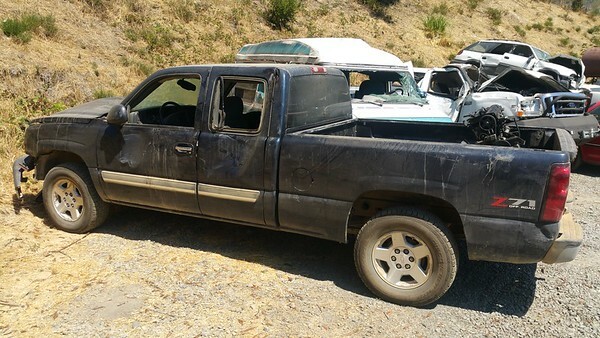 The interior was rough as it was a pot farmers truck just extremely dirty. Yeah, so, the body is rough. The passenger side doors are totally fine, only one small shopping cart dent that i have seen so far. As mentioned the bed is rough but fixable, but hell with that, i just bought a beautiful correct color bed for cheap, the problem with the new to me used bed is that one of the bed bolts spun the welded nut off while the yard guys were removing it and thus it was deemed 'unsellable'. a little work and a little welding and i think it will be fixed better than new. the price was way right so i will give it a whirl and be happy with the outcome. The cab had a little damage to the upper corner of the C pillar on the driver side, as you might be able to see in the picture, ain't hardly nuthin! Yeah right! i bought a cab corner and set out to fix the outer skin of the cab and asked my body shop guy for a second opinion and well S#!T! "4-6 hours on the frame rack oughtta fix it". Well for less than the cost of 6 hours on the frame rack i picked up a cherry cab, wrong color of coarse. whilst the loader operator was maneuvering the loader to get the cab off the truck or on to the pallet (i dunno which) he ran into the cab with the fork and put a nice dent right in the passenger side half door jamb. figures huh? I am currently working on getting the cab scuffed down so i can shoot all the jambs and visible parts BLUE. 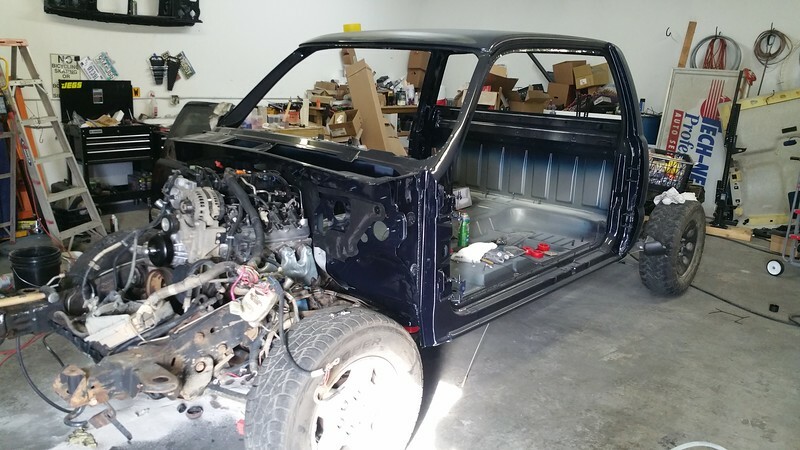 So the only original sheet metal parts that i will be using on this truck will now be the passenger side doors and the tailgate. LOL way beyond the point of no return so i just kept going. this hole is getting deep. I hit rock bottom and rented a jackhammer so i could keep digging. This is it right after i got the cab to the shop to begin work on it. In order to get the thru beams thru, i had to gut the cab, including the dash. All these parts needed to come out anyways so that i could scuff and paint every possible inch of the cab that MIGHT be visible once it is reassembled. Alright, so now i gotta get the old cab off and dispose of it, the new cab being the wrong color needs to be stripped completely of every part that can be unbolted so that i can scuff every square inch of it and blast it blue. after a couple hard days this past weekend while my wife was out of town i go the old cab off and the new cab up on a redneck 5 post lift. many hours on the creeper later and the underside of the cab is ready for paint, the firewall is 98% ready for paint, i just need to prep one small surface rust spot where the once diesel battery leaked down the firewall and made a spot on the pinch weld. 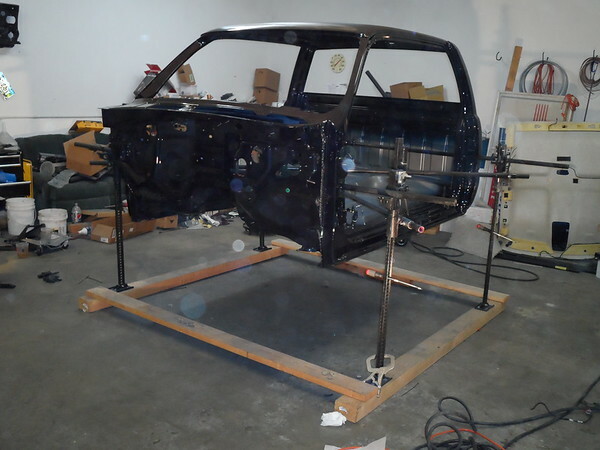 the urethane that was used to hold in the front and rear glass has been removed and i am hoping to get the inside of the cab scuffed up and MAYBE blue by sunday evening. never mind the mess, yes i know my shop is a huge f'ing disaster, but its what i got for now. Four of the 54 inch farm jacks with 1 1/4 scd 40 pipe thru the cab side to side for lift points, then i am using 1 1/4 scd 40 pipe diagonals and 1 1/2 scd 40 pipe welded to 2 inch sch 40 pipe and bolted all together to make it more stable side to side and it also acts as a safety measure so that the cab cannot drop on its own. with everything done like this it is pretty stable, not that i am willing to find out how stable it is with me in the cab, but it remains completely height adjustable. the only downside is that the lowest of the two crossbars is only about an inch off the cab floor making it difficult to scuff the cab floor and i see potential issues with painting the cab floor. cross that bridge when i get there i guess. I have spent the last few weekends scuffing and scrubbing and prepping the cab for paint. and i mean i have spent all this time prepping to paint the jambs, firewall, underside, inside roof, around the windows and the back cab wall. Let me tell ya, my fingertips are raw and i dont ever want to do anything like this again! I spent about 6 hours sunday prepping the last bits of the cab. 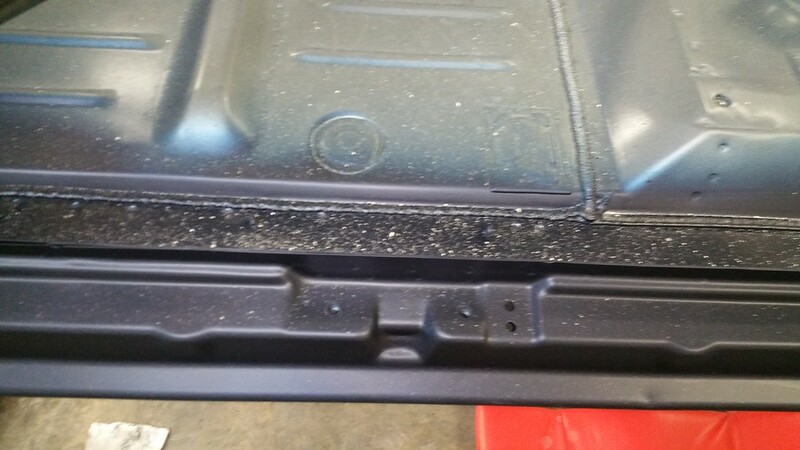 I wimped out and only prepped the parts that are visible when the truck is reassembled, i decided i had wasted enough time doing this, and painting the inside of the roof and the inside floor pans was an absolute waste of prep time and paint, so like i said, i wimped out. I have not sprayed a base / clear in 13? years. I have not sprayed a metallic in 21 years, and that was a single stage paint. I was told these new paints spray different than they did just a few years ago and that the new metallics spray like they are not metallic. I was told that the clears spray like water from a hose and run off the target in the same fashion. needless to say, i was a bit nervous spraying only the jams, and leaving the exterior paint work up to a professional (friend). So i mixed up about half a gallon of base coat and went to town spraying the parts i intended to spray. I sprayed the base on way wet, in my mind i was spraying a single stage paint and had to stop and take a breather to remind myself its not a race and that it goes on semi dry. I sprayed all the UP facing surfaces first, then the vertical surfaces and then the DOWN facing surfaces inside the cab. Finally i got on the creeper and crawled under the cab and hosed, literally hosed the underside of the cab. Lighting was not so good so there are a few spots where coverage is lacking but f-it chances are no one will ever see these places even if they set out to look for them. Next i mixed up a little more than half a gallon of clear and set to spraying again. I got the UP facing surfaces again first, inside of the cab, the underside of the cab and was working on the firewall when my shop building SHIFTED from a gust of wind and it started snowing drywall mud all over my 90% freshly cleared cab. The entire truck was covered with drywall mud dust. I simply cussed loudly, then dumped out a bunch of fresh clear and set to cleaning my gun, i was done for the day. 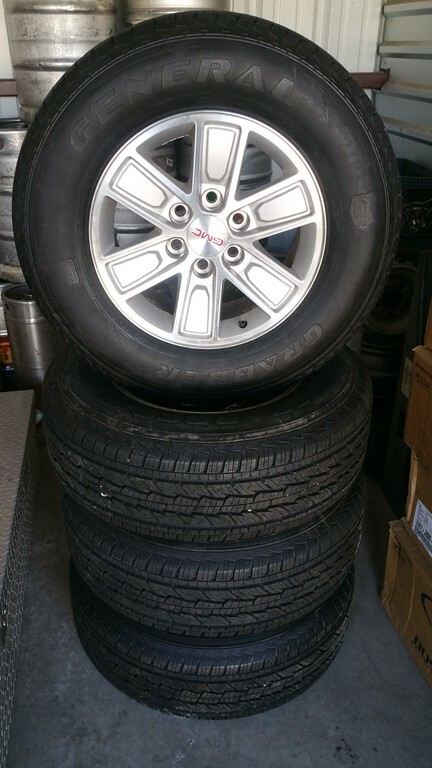 Now i have to scuff the entire truck AGAIN! and re-base coat most of it and re-clear all of it. The good news -kinda- is that as much color and clear as i hosed all over the underside of the truck, and being that i have not sprayed base clear in ages, I only had one small run in the whole thing. AND it was a run in a place that i have to sand smooth again anyways to prep it for final painting. I was very surprised to see that in the places where i was expecting runs there was not a single one. I like this new Base / Clear paint. And the metallic seems to have laid down nicely, of coarse i havent seen it in the sun, and probably wont for a while (winter has set in). turkey day will be spent in the shop scuffing, yay me! I have recently ordered a whole ton of parts for this truck... I am just waiting for all of the parts to show up and then the body to be done so i can start the final assembly of the damn thing. I am down to 32 days... its gonna be tight. 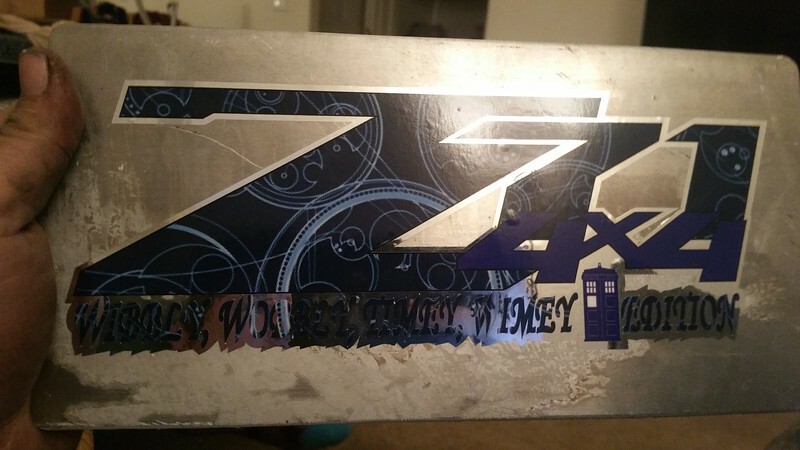 I am working on designing up the doctor who z-71 logo and wheel stickers. what else? i dont remember, too much to list and its getting late. Now the task of putting it all back together. Got the rolling chassis engine and trans rolled over to the shop where things will get assembled. Pulled one head off a couple/few weeks ago to start in on a head gasket set and new lifters. sunday i got the other head pulled and started cleaning things up in anticipation of reassembling the engine and then get the cab back on the frame. monday night i was cleaning up the last head (driver side) and getting ready to install everything. the rear exhaust bolt had previously been busted and the PO screwed up the extraction pretty bad, sorry no photos, i am horrible at not getting photos, anyways i had to drill tap and heli-coil the hole, but the good gents over at napa decided to argue with me about the size and after a quick search on their system they sold me the heli-coil kit. after drilling tapping and installing the heli coil, i quickly found out that the kit they sold me was the wrong size. today i ordered the correct bolt to fit the single wrong size hole, 25 bolts actually since there was a 25 part minimum order. oh well, lots of extras. tonight i got the heads bolted back on. lemme tell ya, i absolutely hate the torque to yield BS bolts, that 90 degrees and then 70 degrees seems like a huge window for opportunity to screw up. I honestly think that next time i do a head gasket i am gonna spend the extra $$ for ARP reusable studs. seems to me that using actual torque values is much safer than using dumb torque angle tool. tomorrow i hope to get the rockers, new knock sensors, valley cover gasket, and water pump installed, maybe even the intake manifold... then i can work on connecting all the wires back where they go, i hope i can remember where they go. cab is sitting on the chassis. engine is 99% done, just need to torque down the left side exhaust manifold and connect the Y pipe to the manifold, need muffler bearings to do this. prepping doors to paint the jams and hopefully install the doors this weekend. then i can start working on installing the front sheet metal Christmas weekend. This is supposed to be a FINISHED Christmas gift for my wife, sad to say i am not going to make the deadline. she will get a promise of a complete truck for Christmas. Then hopefully she will get the HINT that i need some ALONE time (OR she can come help me, yeah right!) in the shop to complete projects. We live in an apartment so honey-do's are minimal, but, she thinks i go to the shop to sleep because my work week is so long, hahaha. I have other pictures but they are on my camera still. will post those up when i think to bring the camera home next. 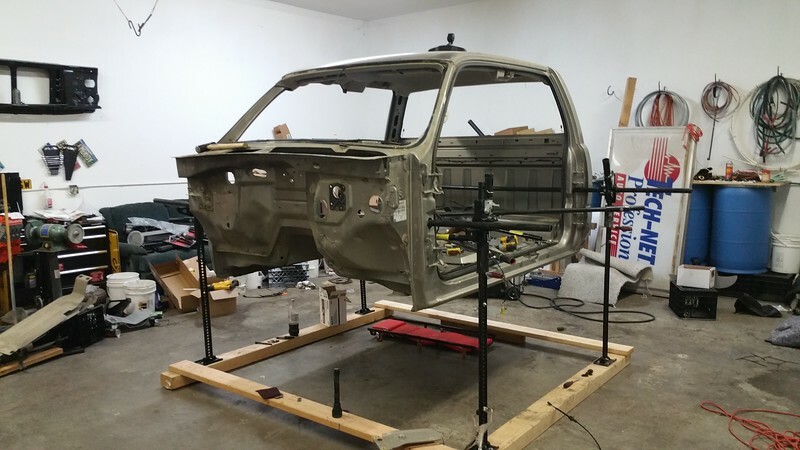 Got the door jambs painted today, I think i will be able to hang the doors next weekend and get started on getting the inside of the fenders and hood painted and start putting the front end back together the following weekend. crossed fingers that the clear doesnt run off the doors tonight as it is below freezing here tonight. I was not able, obviously to give the truck to my wife completed for Christmas. instead i was able to give her the IDEA of a truck lol. I gave her the key fobs, told her i got her a remote start (didnt state which vehicle it was for) that she always wanted. 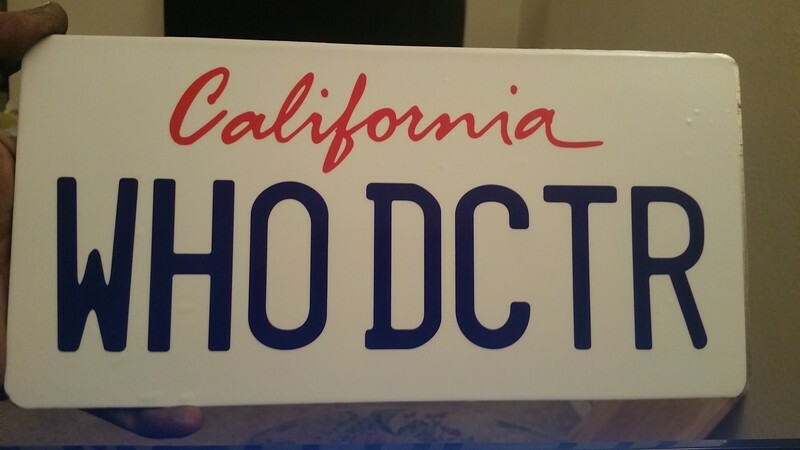 Then i gave her the counterfeit customized license plate that has been on order since september. then i gave her the custom Z71 stickers that i had made for the truck. Finally I presented her with the very last gift i gave her was a die cast toy from wally world, a RED 2014 Crew Cab Chevy truck. yeah it was the wrong toy but it was all i could find. Since the Z71 stickers were printed out the WRONG size i stuck one to the back of the faux license plate. All of the door seals should arrive tomorrow, along with new cab bolts. I misplaced a milk crate full of bolts in labeled zip lock bags. I am sure that once i get the shop cleaned up that particular milk crate will make its presence known. BUT in the mean time i just ordered new cab bolts because they were $3.06 each. I cant hardly spend the time to clean up the original bolts and paint them for that price, geeze. 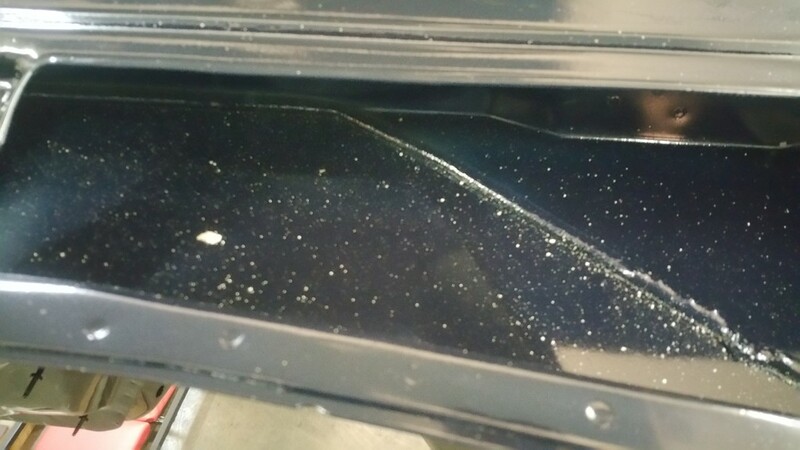 I am having to repaint the jamb of one of the rear quarter doors because I missed a good size section with color AND clear, so i scuffed that jamb down and did some spot painting. In the process of doing the spot repair the original paint lifted and bubbled and wrinkled in a major way. So tonight i spent an hour or so sanding some of the paint off and started prepping it for new paint from a bare surface. so sealer, primer, then color and clear. not happy about this but oh well, it happens right? I am just glad it was only ONE jamb and it is the jamb that is outward when the front door is open, and NOT the entire inside of the door. should have it re-painted by friday night and I can actually hang the doors on saturday or sunday.